A European Experiences trip has an ideal balance of structure and flexibility, activities with the group and time on your own. Plans may be adjusted based on weather, the interests of group members, and unexpected opportunities. We’ll describe a “typical” Puglia Experience week, but every trip can be somewhat unique. Your trip might be organized differently, and for various reasons, experiences may be added or not included. We’ll also surprise you with some special stops when we’re together. Our group will meet mid-afternoon at the Bari airport. We’ll travel about an hour down the Adriatic coast to Ostuni, our home base for the next week. Set on a hilltop with views extending to the sea, Ostuni is known as the “white city” because of its glistening whitewashed houses. Our hotel is in a beautifully-restored historic building dating back to the 13th century, located on a pedestrian street in the medieval center. You’ll have time to settle into your room before we head out for an introductory walk around Ostuni. Later we’ll gather for welcome drinks and then walk to a nearby restaurant for a special Puglian dinner. We’ll enjoy breakfast every morning in the hotel dining room, offering a buffet of breads and pastries, cheeses, meats, fruits and more. We’ll spend our first full day in the area around Ostuni. In the morning we’ll visit an historic “masseria” near Fasano, a fortified 150-acre farm dating back to the 16th century. 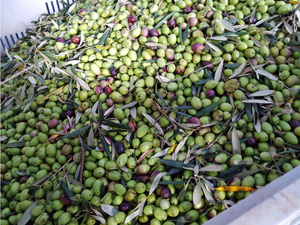 The primary activity today is olive oil production, and the complex is surrounded by 2,000 olive trees., 900 of which are over 1,000 years old! Our host Alessandro is passionate about olive oil. He’ll introduce us to his modern olive mill, as well as the oldest part of the masseria which showcases equipment used for hundreds of years. Alessandro will also lead a very interesting educational session about olive oil, including a tasting of his organic olive oil. You’ll learn so much about this important part of the culture and history of Puglia. After our visit we’ll enjoy a casual picnic lunch in the olive groves of the masseria, surrounded by the ancient trees. In the early afternoon we’ll return to Ostuni, where you’ll have some free time to explore the beautiful white city. Later we’ll travel to another unique masseria below Ostuni for a cooking class in a very special setting. Our teacher, Anna Maria, will help us prepare a meal of Puglian specialties, including fresh pasta. After our cooking, we’ll relax in the environment of this 17th century farm complex and enjoy the excellent meal we’ve prepared together. Today we’ll travel to historic Lecce, known as the “Florence of the South” for its magnificent Baroque and Renaissance architecture. Our guide Vincenzo will lead us on a walking tour of the town where we’ll admire Roman ruins, churches, beautiful squares, and fascinating secret corners as we make our way through the winding streets. We’ll also discover the artisan craft of paper mache, a unique tradition in Lecce. Lunch will be at a modern delicatessen-style restaurant near the duomo, popular with locals. We’ll sit at long, communal tables to enjoy our casual meal. After lunch, we’ll visit Museo Faggiano, where we’ll learn more about ancient Lecce. The museum represents the fascinating story of a man and his sons who purchased a building planning to open a pizzeria and ended up discovering an ancient world—and a very different project– underneath their building. You’ll have some free time in Lecce to explore this fascinating town on your own. There’s some very good shopping in Lecce, as well as many places to enjoy an afternoon beverage, pastry or gelato. Later in the afternoon a very special winery located in the town of Guagnano will welcome us for a taste of their Primitivo and Negromaro wine varieties. We’ll be hosted by the owners who will also show us their wine museum and the unique art they’ve incorporated into their operation. We’ll enjoy a private dinner at the winery, an antipasti buffet featuring focaccia breads, cheeses, salamis, and other local specialties. Vincenzo will join us again today. In the morning we’ll have a fascinating visit to the town of Grottaglie, the major center for the ceramics industry in Puglia with dozens of ceramics workshops. Some ceramics are produced for decoration and some for use in the home. We’ll explore the narrow streets of the historic center, focusing on the “Quartier dell Ceramiche,” including a group visit to one of the workshops. Then you’ll have time on your own to visit other workshops or to relax over a coffee. We’ll return to the Valle d’Istria to visit historic Ceglie Messapica, one of the oldest towns in Italy (15th century BC), with a well-preserved historic center, including an imposing Ducal castle. Today Ceglie Messapica is known as the gastronomic capital of this area of Puglia. Our group will enjoy a special lunch at a noted Slow Food restaurant, which focuses on suppliers from the surrounding area. You’ll enjoy the opportunity to further experience the delicious Puglian cuisine in this very unique setting. 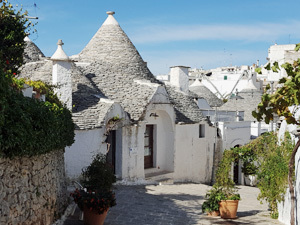 A highlight of our week will be our late afternoon visit to Alberobello, a UNESCO World Heritage site, where Vincenzo will introduce us to these incredible, white cone-shaped trulli houses. There are over 1,500 truilli houses in Alberobello, split between two districts on opposite hills. You’ll definitely want your camera for this memorable visit. Dinner tonight is on your own. There are many options in Ostuni, including possibilities for a light meal. 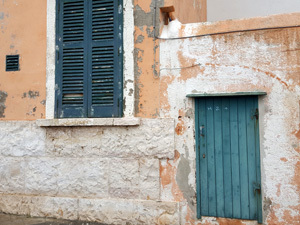 Today we’ll travel south to the area known as Salento, a narrow peninsula between the Ionian and Adriatic seas…. the end of the “heel of the boot.” Vincenzo will be with us again today. Our first stop is the ancient town of Otranto, located on the east coast and with lovely views across the sea. Originally a Greek town and later an important Roman city, Otranto has a small harbor and a beautiful 11th century cathedral. Outside Otranto we’ll stop at the lighthouse of Punta Palascia, the easternmost point of Italy, in the heart of a regional coastal park. 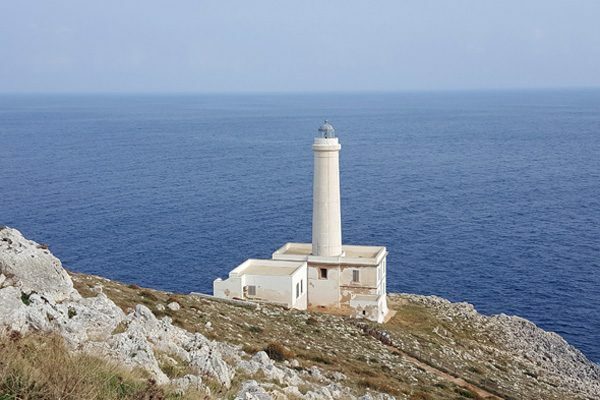 The lighthouse watches over the spot where the Adriatic meets the Ionian Sea and is the closest point to Albania—just 50 miles across the sea. Lunch today is at a rural masseria offering a true “farm to table” meal in a very special environment. The sprawling property also includes an ancient olive mill underneath the large stone farmhouse. Surrounding the main house are hundreds of olive trees, fruit trees, fields of vegetables, and stables and pens for animals. Everything we eat will come from this farm, and we’ll be offered an array of dishes, whatever is in season. This is an experience you’ll remember for a very long time! 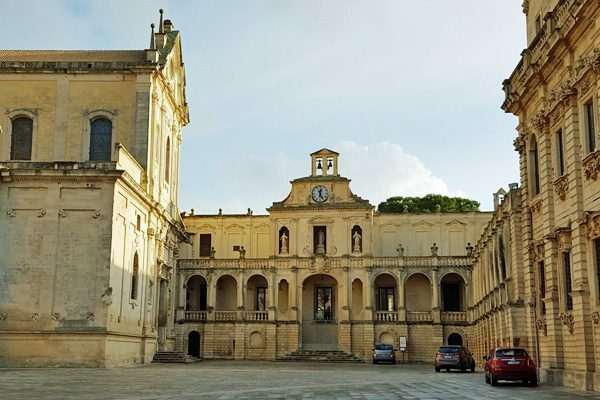 We’ll end our time in the Salento in the vibrant town of Galatina, where the highlight will be the stunning Basilica of Santa Caterina d’Alessandria, a treasure chest of art including magnificent frescoes and reflecting a range of architectural styles, from Romanesque to Gothic, Norman to Byzantine. Dinner tonight—if you’re still hungry!– is on your own in Ostuni. It’s another chance to try out that interesting little trattoria you spotted earlier in the week. We’ll travel north along the Adriatic coast, beginning our morning in the tiny fishing village of St. Vito, where we’ll enjoy morning coffee in a café overlooking the sea. A few miles south, we’ll visit the historic town of Puglianano a Mare, dramatically-situated on a rocky promontory jutting out into the sea. Known as the “balcony of Puglia,” the town offers traces of its Arab, Byzantine, Spanish and Norman past, but is especially recognized for its breathtaking views. It’s also famous as the hometown of Domenico Modugno, composer of the song “Volare,” honored with a joyful statue by the sea. We’ll enjoy lunch in the small fishing village of Savelletri at a typical trattoria known for its fresh fish and seafood. Vincenzo will meet us in the afternoon, as we visit the seaside ruins of Egnazia, one of the most important Roman sites in Italy. The Via Traiana, the ancient Roman road linking Rome to Bari and Brindisi, passed through Egnazia and remains of the road are still visible today. Established in the 13th century BC, this site was first a Bronze age settlement, then a Greek colony, and finally a Roman city and port for trade and commerce. Abandoned in the 10th century, it was re-discovered in 1912. In addition to exploring the ruins of the city and port, we’ll visit an impressive underground tomb from the 4th to 2nd century BC, the necropolis (cemetery, and an impressive archaeological museum. For dinner tonight we’ll have a casual meal at a pizzeria in Ostuni. We’ll spend our last full day together in Puglia in the Valle d’Itria near Ostuni. This is the major area for trulli houses in Puglia, and we’ll spot many of these unique dry-stone huts as we travel through the countryside. We’ll begin our morning at a 17th century masseria near Ceglia Messapica, where the owner Cosimo farms 200 acres that once belonged to his grandfather. Cosimo raises cows and buffalo, has a small cheese production dairy, and a busy farm shop. 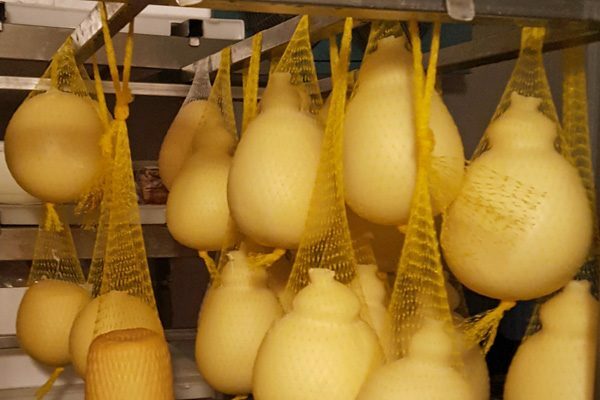 He will proudly show us his cheese-making operations and then offer us samples of local salamis and his fresh and aged cheeses, including caciocavello, buffalo mozzarella, and burrata. We’ll next visit the medieval hilltop town of Cisternino, with its unique architecture, narrow streets, and whitewashed houses. This is another gastronomic mecca in Puglia, known for the butcher shops with small attached restaurants called “fornellos.” We’ll have our last lunch together at a typical fornello. In the afternoon we’ll visit a family-owned winery below Locorotondo, another beautiful hilltop town in the Valle d’Itria. Our tour of their property includes a visit to a trulli farm as well as their modern winery, followed by a tasting of several of their excellent wines. After our return to Ostuni, we’ll gather for an apertivo at our hotel, followed by a special farewell meal at a local restaurant. After breakfast at our hotel, it’s time to say goodbye to this special place. We’ll travel by bus back to the Bari airport, where you can continue your travels in Italy or begin to make your way home. We know you’ll take with you wonderful memories of your experience in Puglia!